by Laura Young Baxley and William S. Powell, 2006. 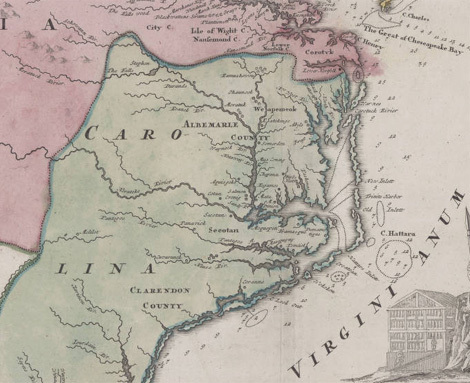 The name "Albemarle" was applied to the section or region of northeastern North Carolina that was the earliest permanently settled part of the colony. Settlers began moving there about the middle of the seventeenth century, settling along the northern shore of the sound that was first called the Sea of Roanoke (1609) or Roanoke Sound (1657) and, for a very short time, Carolina River (1663). It is known today as Albemarle Sound. In 1664 a county of 1,660 square miles with imprecise boundaries was created and named Albemarle for George Monck, duke of Albemarle, one of the Lords Proprietors of Carolina. The county was divided into Chowan, Currituck, Pasquotank, and Perquimans Precincts in 1668. Albemarle County ceased to exist as a unit of government in 1689, and the precincts came to be recognized as counties. In time additional counties were created in the region, but the northeastern corner of North Carolina is still referred to as the Albemarle region. Although the Albemarle region of North Carolina was by the 1660s the site of the only structured government in the colony, there were several factors that slowed its development. Communication with other colonies, except Virginia, was virtually impossible for the area. The Outer Banks prevented direct navigation. The waters surrounding the Albemarle region would not support large ships, which further inhibited growth. Also, many of the Lords Proprietors focused their energies and finances on the easier-to-settle southern part of the colony, blaming the Albemarle residents for a lack of interest in development. Government leaders of the Albemarle region attempted to overcome these serious obstacles in a number of ways. Several laws were enacted in an effort to entice new settlers to the region. A proclamation by the governor brought land ownership laws into accord with Virginia's, making movement from one colony to another easier and encouraging migration. To distribute land ownership more equally (and probably to prevent speculating), ownership by one party of more than 660 acres was prohibited, except by direct grant from the Lords Proprietors. Trading privileges with the Native Americans in the area were reserved for official residents of the colony, which stimulated the economy and encouraged traders to make Albemarle a permanent home. The legislature approved acts that excused new settlers from taxes for one year and also pardoned new settlers from paying any debt accrued inside or outside the colony for five years. These measures allowed new settlers to establish themselves and their families before burdening themselves with large debt payments. Some Virginia authorities, however, viewed the law as encouraging only debtors to settle in the Albemarle region. There were few religious leaders in Albemarle, yet the government wanted to encourage family development and settlement. As a result, the legislature also approved licenses for civil officials to perform marriage ceremonies. This unconventional measure, along with the region's reputation as a haven for ne'er-do-wells of all sorts, provoked insulting epithets from Albemarle's Virginia neighbors, the most popular being "Rogue's Harbor." Homann, Johann Baptist. 1700s. "Virginia, Marylandia et Carolina: in America septentrionali Brittannorum industria excultae." North Carolina Collection, University of North Carolina Chapel Hill. Online at http://dc.lib.unc.edu/cdm/ref/collection/ncmaps/id/56. 1 January 2006 | Baxley, Laura Young; Powell, William S.